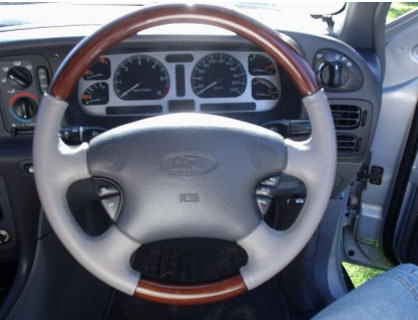 This document describes removal and installation of the EF/EL Falcon steering wheels. Removing the standard GLi steering Wheel and replacing with an upgraded E series or even AU series Wheel. Obviously the DF/DL and NF/NL range of Fords will be the same. 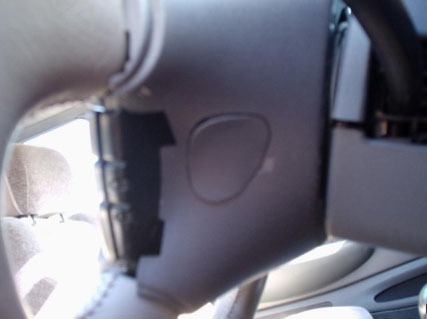 to prevent any possible injury, best bet is to disable the airbag module, so it doesnâ€™t go off in your face! Either disconnect the battery or remove the airbag fuse in the fuse panel â€“ or both. Leave it for 10mins or so to ensure all power has drained out. on either side you will find 2 clips â€“ use a flat-head screwdriver to pop these off. Underneath you will find a 10mm bolt on either side. You will need to undo these. 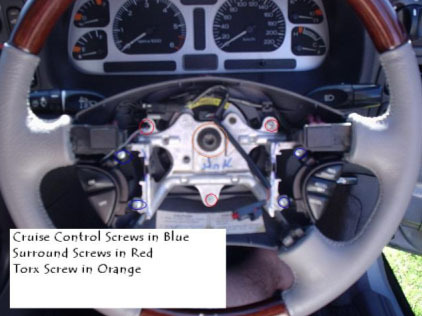 The airbag is now removed from the wheel â€“ you should be able to pull it out easily. 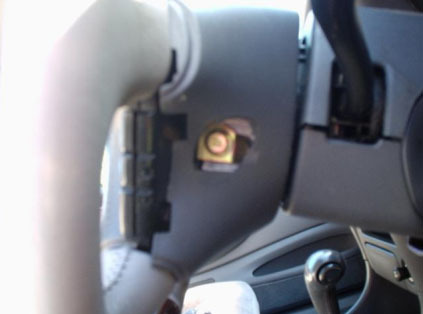 You will then need to disconnect the airbag electrical clip â€“ easy enough to do! Remove the clips (as shown above) on either side to reveal the 10mm bolts as shown below. depending on if your model has been fitted with cruise control or not, will depend on how many screws you now have to undo! Models without cruise will only have 3 screws, which hold in the backing plastic plate. Models with cruise control will have an extra 4 screws holding in place the buttons on either side. Make sure you are very careful with these, as if you break one of the buttons, it could be a very expensive replacement! You will also need to pull off the horn buttons on either side â€“ they just pull out of the foam very easily. Nexessary screws to remove shown above. this is the hardest step â€“ the actual removal of the original wheel. You will need to loosen the torx head screw in the middle of the wheel â€“ but DO NOT fully take it off â€“ I cannot stress this enough! â€“ as if you do, you may need some serious dental work if the wheel hits you in the teeth! By leaving the screw Â½ on, it prevents the wheel flying back when you pull it off. The original wheels will take (in most cases) a fair bit of strength to get off. Wiggle/pull/curse/swear at the thing until it loosens & comes off â€“ it may take a while, but it has to be done! once the old wheel is off, put the new wheel back in place, and screw everything back on, in reverse order as in the steps above. Now enjoy driving with your new wheel! Document written by: uglybob on 19 2006>, Copyright © 2006 uglybob, all rights reserved.